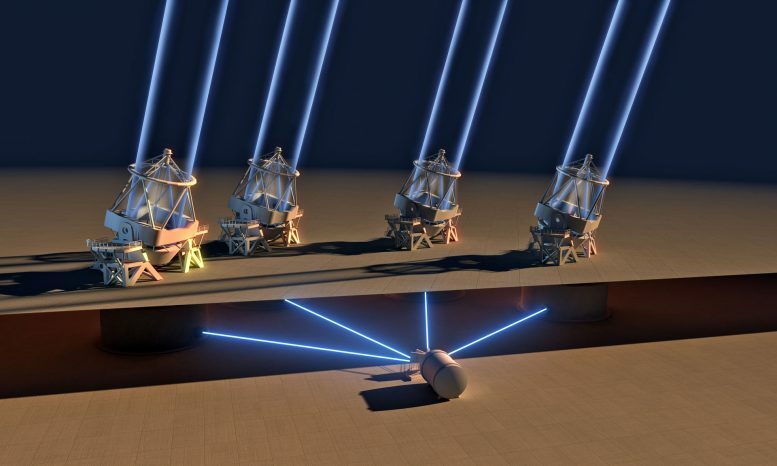 The ESPRESSO instrument on ESO’s Very Large Telescope in Chile has for the first time been used to combine light from all four of the 8.2-meter Unit Telescopes. Combining light from the Unit Telescopes in this way makes the VLT the largest optical telescope in existence in terms of collecting area. One of the original design goals of ESO’s Very Large Telescope (VLT) was for its four Unit Telescopes (UTs) to work together to create a single giant telescope. With the first light of the ESPRESSO spectrograph using the four-Unit-Telescope mode of the VLT, this milestone has now been reached. When all four 8.2-meter Unit Telescopes combine their light-collecting power to feed a single instrument, the VLT effectively becomes the largest optical telescope in the world in terms of collecting area. Due to the complexity involved, the combination of light from all four Unit Telescopes in this way, at what is known as an “incoherent focus”, had not been implemented until now. However, space for it was built into the telescopes and the underground structure of the mountaintop from the start. Light from the four Unit Telescopes is routinely brought together in the VLT Interferometer for the study of extremely fine detail in comparatively bright objects. But interferometry, which combines the beams “coherently”, cannot exploit the huge light-gathering potential of the combined telescopes to study faint objects. Feeding the combined light into a single instrument will give astronomers access to information never previously available. This new facility is a game changer for astronomy with high-resolution spectrographs. It makes use of novel concepts, such as wavelength calibration aided by a laser frequency comb, providing unprecedented precision and repeatability, and now the capability to join together the light-collecting power of the four individual Unit Telescopes. Be the first to comment on "ESO’s VLT Combines Light From All Four Telescopes For First Time"